When the 2014-15 hockey season opens, a lot of things will be different about the Pittsburgh Penguins. Familiar faces are gone and in their places will be those we only know as opponents. One of the returning favorites will be Pascal Dupuis who hasn't played since he injured his knee in December when Marc Methot hit Sidney Crosby, which propelled Crosby into Dupuis. His knee bent awkwardly and it was later determined he tore his ACL. I was surprised at the number of people who were judgmental of Pascal Dupuis’ knee injury, subsequent surgery and rehab. Seems everyone feels comfortable critiquing something like an ACL tear because, let’s face it, most people know someone who has had one. The reality is, the entire approach to the ACL is different for a professional athlete than it is for a car salesman who plays dek hockey on the weekends. When Dupuis wasn’t rushed to the OR after his injury some were critical calling it the strangest ACL recovery ever. In reality it was smart. Most surgeons prefer not to rush an injury to the operating room. First off, you never want to operate on swollen (edematous) tissue unless you have to. Swelling distorts the tissue and makes it hard to actuate the extent of the injury. Sewing distorted tissue is riskier than putting two clean ends together and healing is adversely effected. A second point is Dupuis has years of wear and tear on that knee. He has no doubt played through many minor injuries over the years which have changed the general architecture of his knee. If you jump into surgery before the knee has calmed down enough to show you it’s individual ‘normal’ you can cause more problems in the end. Lastly, at the end of the day, Dupuis needed to be able to return to his high performance game. I’m not going to debate whether Dupuis belongs on a line with Sidney Crosby. The fact is, he was on a line with Crosby. He got there because he plays an aggressive fast game. If you’re his surgeon, you have an obligation to return him to that game: his livelihood and your reputation are at stake. 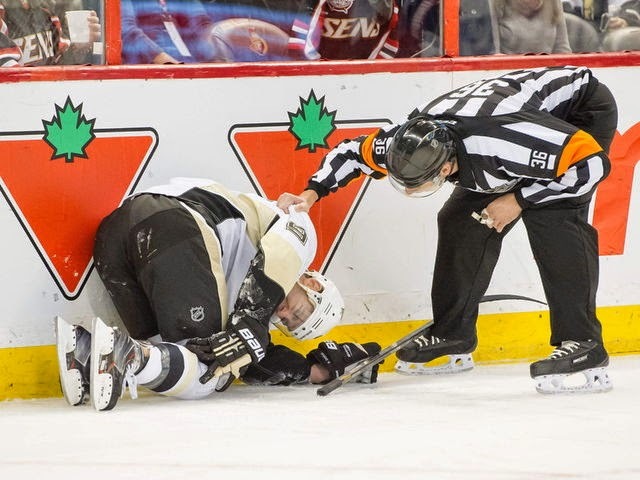 So yes, Dupuis missed the rest of the 2013-14 season and didn’t have surgery until he ran the lower bowl steps at CEC. Being an athlete doesn’t give you super healing powers, even if you are ‘Super Duper’. Bodies heal as fast as they heal. A driven athlete like Dupuis who has the best equipment and training staff at his disposal will no doubt devote himself to being in top shape by the time training camp opens. The reality is healing and recovery won’t be considered 100% until about 12 months after surgery. He isn’t returning to being a weekend warrior, he’s a professional athlete and needs to use that knee to it's full capacity. 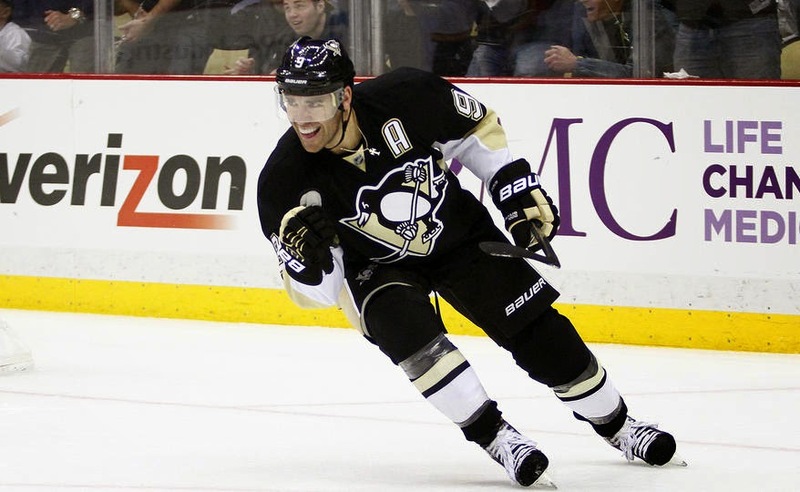 Pascal Dupuis will return to the ice this fall as a 35 yr old. In the NHL that makes him slightly past his prime. He played 39 games in the 2013-14 season; scored 20 points and averaged 17:42 TOI per game. Will he return to the first line? He faced constant scrutiny from those who felt he didn’t belong on the Pens’ top line with Crosby and Chris Kunitz. The combination of Pascal Dupuis, Sidney Crosby, and Chris Kunitz paced the NHL with 70 even-strength points scored through the truncated 48 game season of 2012-2013. His presence made the first line better. Yeah, he brought a threat off the rush and was the first man in on forecheck but,in short, he opened up things for Crosby & Kunitz. Not everything a player contributes can be tracked by Corsi. There are still qualities an athlete like Dupuis brings to the game that are intangible. Those are the things he brings away from the puck as well as what he brings with his heart and his brain. When the puck drops on the 2014-15 season, Dupuis will be competing for the first time on his repaired knee. He’ll play on whatever line his team needs him to. He’ll return to skating fast, going to the dirty areas and killing penalties like a boss. He’ll bring humor and wisdom to the locker room in a way that can’t be measured by conventional means. The reality is, Pascal Dupuis may not be one of the Penguin’s superstars but he is one of the things that makes the Penguins great.